Why lose the investment you’ve made in your business application built on MultiValue? Instead let us help you modernize your application to grow your business, save money, gain flexibility, improve performance and stay competitive. Entrinsik has been working with MultiValue databases including UniData® and UniVerse® for decades. Informer 5 represents a new generation of business intelligence and data analytics for the MultiValue market, simplifying the process of accessing, cleansing, blending, and analyzing data from multiple sources. 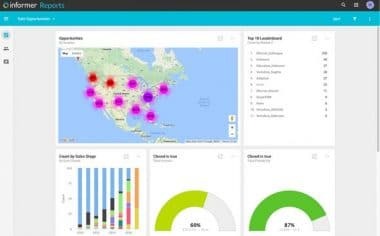 Aggregate all your disparate data, including spreadsheets, using a single platform to create a cohesive, curated, governed data hub for self-service data visualization and analysis across your organization. Informer has been the best investment we've made since we converted our administrative software to a UniData platform. With its easy, web-based, real-time, point and click interface, Informer delivers a powerful reporting solution that is affordable and would be almost impossible to be without now. 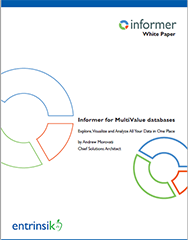 Read this whitepaper if your system is built on a MultiValue database.